In an opinion piece titled “Russians Deserve Better Than Putin,” published by the Russian news website Pravda.ru, McCain took aim at the current Russian leadership, including President Vladimir Putin. The piece by McCain comes one week after Vladimir Putin made headlines by publishing his own opinion piece, “A Plea for Caution from Russia” in the New York Times, on the eve of U.S. – Russia negotiations over Syrian chemical weapons. A ban on the promotion of "gay propaganda" among minors became law in June, as Putin began his third term as president. The article was published Thursday, after some initial confusion over which “Pravda” McCain would actually be writing for. Read: Pravda vs. Pravda: Which one is McCain writing for? The Pravda McCain had publicly said he wanted to be published in is one of the oldest Russian newspapers, founded in 1912. Pravda, which means “the truth” in Russian, became the biggest newspaper during the Soviet period of Russian history. It was the official mouthpiece of the Central Committee of the Russian Communist Party. The newspaper was closed down after the collapse of the Soviet Union in 1991, then reopened in 1997 as the official paper of the Russian Communist Party. The current Pravda has a considerably smaller circulation compared to its Soviet glory days. 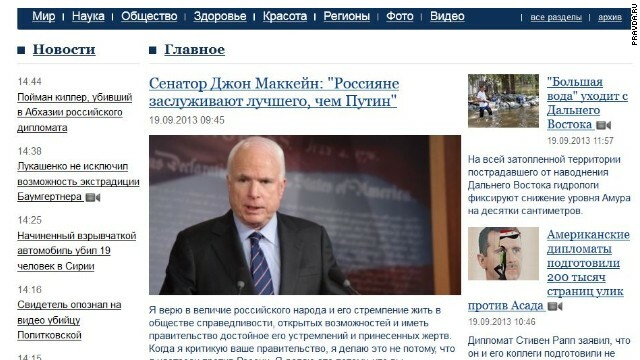 Pravda.ru, the news outlet that actually published McCain’s piece, is an electronic news website founded in 1999. Even though the website also bears the name Pravda, it is not connected to Pravda newspaper. The website has English and Russian editions and covers everything from politics to fashion and celebrities. While editors at the communist Pravda publication said last week they were not going to accept an op-ed by McCain, a spokesman for the senator said McCain submitted one anyway, in addition to Pravda.ru, since there was confusion over the two different Pravdas. As expected, it was not published by the newspaper. Putin said Thursday in a press conference he was not aware of McCain’s opinion piece about Russia. - CNN’s Ashley Killough, Jill Dougherty, NuNu Japaridze, and Laura Koran contributed to this report. Sergei Magnistky wasn't a human rights activist. He was an accountant at a Moscow law firm. He was an ordinary Russian who did an extraordinary thing. He exposed one of the largest state thefts of private assets in Russian history. He cared about the rule of law and believed no one should be above it. For his beliefs and his courage, he was held in Butyrka prison without trial, where he was beaten, became ill and died. After his death, he was given a show trial reminiscent of the Stalin-era and was, of course, found guilty. That wasn't only a crime against Sergei Magnitsky. It was a crime against the Russian people and your right to an honest government – a government worthy of Sergei Magnistky and of you. President Putin claims his purpose is to restore Russia to greatness at home and among the nations of the world. But by what measure has he restored your greatness? He has given you an economy that is based almost entirely on a few natural resources that will rise and fall with those commodities. Its riches will not last. And, while they do, they will be mostly in the possession of the corrupt and powerful few. Capital is fleeing Russia, which – lacking rule of law and a broad-based economy – is considered too risky for investment and entrepreneurism. He has given you a political system that is sustained by corruption and repression and isn't strong enough to tolerate dissent. Hmmm ... McCain ... McCain. Wasn't this guy once, a long time ago, a political player? Didn't he try to stand for President? I thought I remembered him. Or was it Oven Chips? Sincerely this is the worst op-ed I have ever read. McCain uses the word "Believe" no less than 15 times. So he believes in Russia more than a man who is according to McCain "allying Russia with some of the world's most offensive and threatening tyrannies" unlike the US and their support for all the "friendly" 3rd World puppets/dictators they have installed and toppled and re-installed over the years. This is the beginning of the end for the USA, where everything that relates to American foreign policy is either Aid or Military attacks against foreign nations like Spain and England during the 19th Century. The difference between the United States of America and Pablo Escobar's reign of terror in Columbia is............ nothing "Plata e Plomo" You either take America's money and dance to their tune or a Tomahawk/Reaper Drone/Ocuppation is headed your way.